The internet is a powerful tool. It supplies our news, social outlets, and shopping habits. And as more industries go online, fewer brick-and-mortar places are needed. However, this means more opportunities for trucking. Trucking is a steady industry; trucks move most of America’s goods across the country. Starting your own company in an industry everyone depends on seems like a safe bet and it was for Mark Lain. He began contracting with TransAm Trucking 8 years ago, and his business is still going strong. Congratulations, Mark Lain, on your Million Mile Achievement! Like Sandra, we at TransAm Trucking have a great deal of respect for Mark and what he does. He is skilled at time management – sometimes arriving at the receiver 48 hours before the delivery time. He is also a good role model, always willing to help other drivers. “If he hears about a driver who needs a little extra help, Mark is quick to give that driver his phone number,” Sandra said. He wants other drivers to be successful. 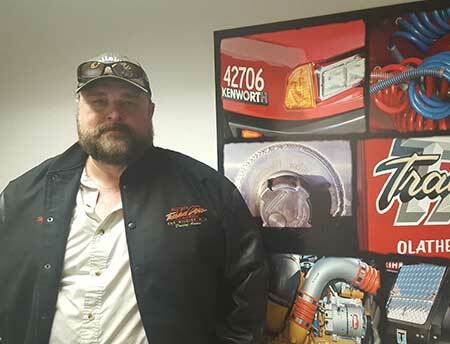 Thank you, Mark, for choosing to contract with TransAm Trucking. We appreciate your hard work. We hope to keep on trucking with you in the future.